Personal composting is beneficial not only for the environment and your local landfills and waste municipalities, but also for your home and your gardens as well. You can boost your plants growth without the use of fertilizers, many of which are harmful for the environment, while also increasing the soil’s ability to retain water, reducing your irrigation needs and your water bills! The average American family generates about 650 pounds of compostable waste every year! If we composted the 21.5 million tons of annual food waste currently being disposed of in landfills, it would reduce greenhouse gas emissions by an amount equal to taking over 2 million cars off the road! Outdoor Tumbling Composter: This tumbling composting barrel is great for those with some yard space. This is the model that we have, and it can hold 37 gallons of glorious food waste! 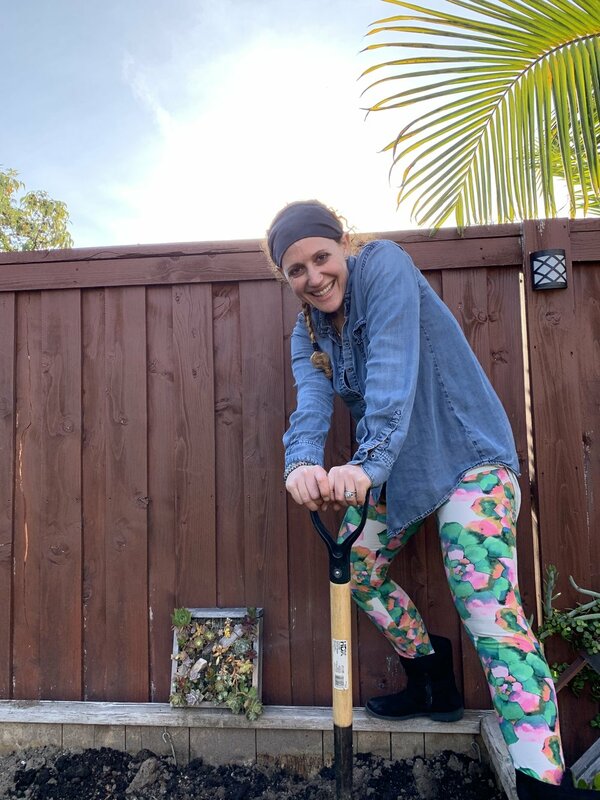 There are two sides to the barrel, so you can be adding scraps to one side while the materials in the other side still cures, so that you never run out of compost! Indoor Composter: If you are an urban dweller, or anyone with limited outdoor spaces this may be a great option for you! 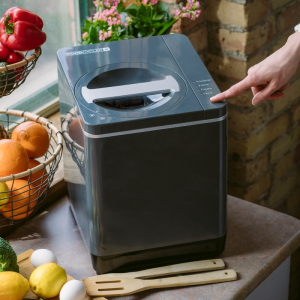 I’ve been really intrigued by the new “Food Cycler Platinum Indoor Food Recycler and Kitchen Compost Container”. This highly modern unit looks like an electric bread maker and is able to compost all kitchen scraps including meats and dairy items. It works by heating the materials, breaking it down into odorless yet nutrient-rich pellets for you to add to your soil as an amendment. The price point is high but it gets great reviews and is all in one, breaking down your scraps into soil within only 3 hours! Worm Composting/Vermiculture - This method utilizes the assistance of the great decomposers - worms - to break down organic materials into nutrient-rich soil. One that gets the best review is the Worm Factory 360. The worms break down the waste quickly and efficiently and the numerous trays allows you to add more waste as you need to. Additionally as the waste is broken down, moisture filters through the system, taking nutrient-rich particles with it. This makes it possible to harvest organic liquid fertilizer right from the spigot at the bottom! These are just three of the hundreds of composting vessels currently out in the market! There is so much variety, you can be sure to find the type of composter that will fit your needs! Once you get your composting vessel here is the breakdown for getting started with composting your kitchen scraps into rich soil for your plants! I always start off with a bit of older soil from my raised beds. Then I add in the yard waste - like lawn trimmings, small twigs and branches, leaves, old flowers. Kitchen scraps like; raw fruit and veggie peels, scraps, spoils, egg shells (crushed), torn-up soiled paper towels and napkins. “Compostable” disposals like cutlery or even the compost pail bag liners - instead I put those in our Green Waste Bin. Begin by adding some soil, lawn trimmings, leaf litter and some compost starter (not necessary although some composters come with this). Add in your kitchen scraps every week (or day depending on the type of composter you have). If you have a tumbling outdoor composter, be sure to spin your vessel approximately ten times every time you add more waste. This will assist in the breakdown process as it aerates and turns the organic materials. Within about three months you should have some compost ready to be added to your gardens! How I use my compost. Spread throughout my food garden prior to planting. To fertilize my trees and outdoor plants. Compost Tea (for plants only!) - put some compost in water tight/safe container. add water (rain water if you have it!) Lit sit for at least 24 - 48 hours. Pour water off the container, and return the compost to your bin to decompose with the rest after giving it some time to dry out a bit. Use the “tea” to water your plants and trees. You can even dilute it a bit and use it with your houseplants as well! Note: Compost tea is for PLANTS ONLY and it totally unsafe for human consumption! So there you have it! All you need to know to get started on your compositing journey. I hope you found this information both helpful and motivating. Once you get started, composting becomes an easy and beneficial way for you to give back both to your gardens and to our planet as well! Infinite Succulent: Miniature Living Art to Keep or Share published by The Countryman Press in 2019.